Let’s just get this out of the way. I need cookies. Something about a cookie just makes me feel, when the stress of the season threatens to be my undoing, that everything will be ok, nothing is that bad, and I can cope. My flavor of the moment is chocolate and peanut butter. 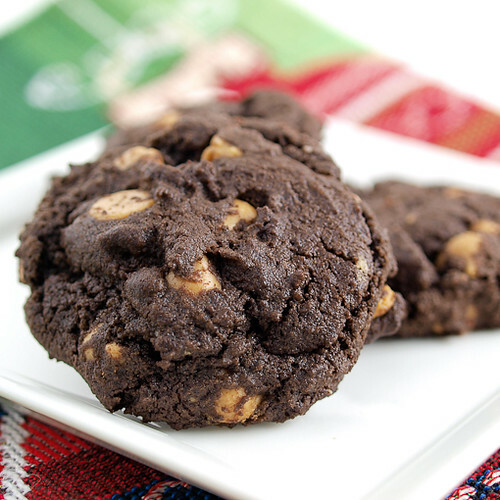 It is really, really working for me, so I took those flavors and made chewy, moist, deeply chocolate cookies studded with peanut buttery chips. They are a revelation, and far better, and cheaper, than therapy. These cookies store very well. In an air-tight container on the counter you can get five days out of them. 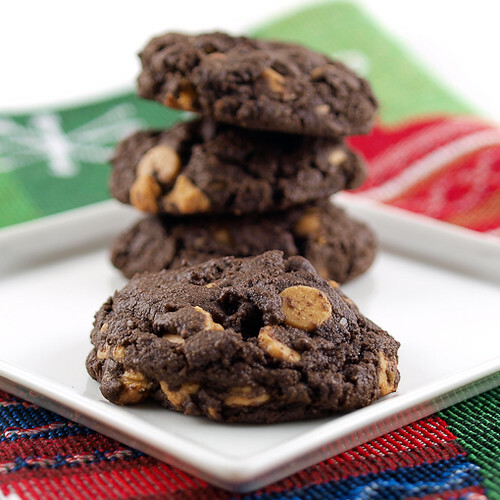 Stored in a zip-top bag in the freezer they last for two months, and if you scoop out the dough and freeze it before baking you can store the cookies for three months. You can bake them from frozen, just add an extra minute of two to the cooking time. 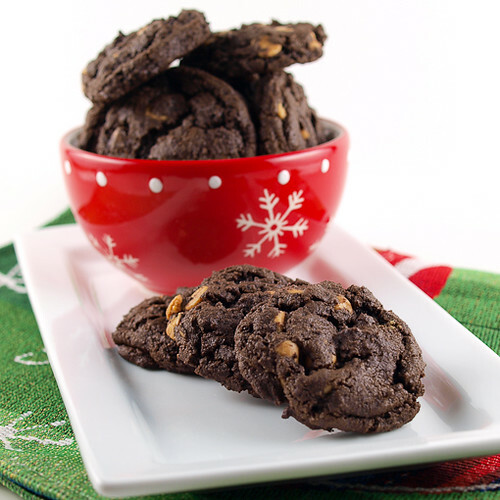 Remember, a little under-baked is preferable to over-baked with these cookies, so after ten minutes in the oven they are most likely done. 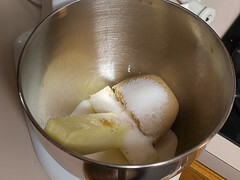 In the bowl of a stand mixer cream together the butter, sugar, and brown sugar until creamy but not fluffy. 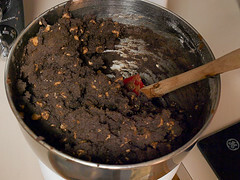 Add the vanilla, salt, and melted chocolate and beat on medium-low speed until thoroughly incorporated. Add the eggs, one at a time, beating well after each addition. 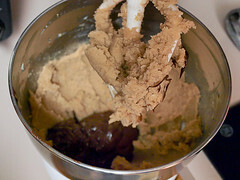 In a separate bowl whisk together the flour, cocoa powder, and baking soda. Add the dry ingredients to the butter mixture and mix on low speed until just combined. 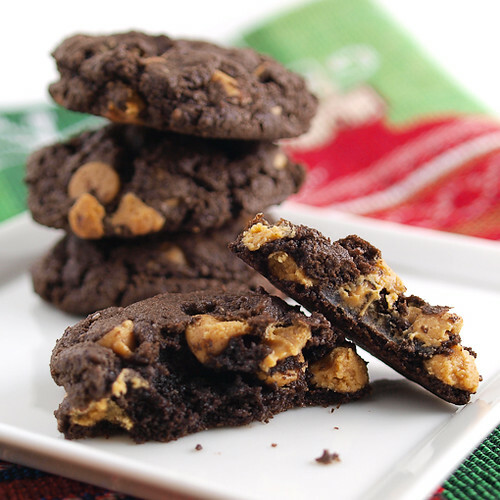 Add the peanut butter chips and mix to distribute evenly. 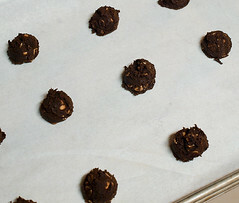 Scoop the dough by rounded tablespoons onto the prepared sheet pans. 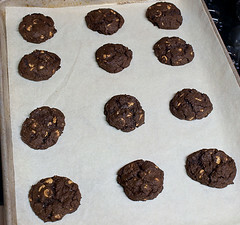 Bake for 10 to 11 minutes, or until the cookies are puffed and just set at the edges. Do not over-bake. Cool on the pan for five minutes before transferring to a wire rack to cool completely.